Twitter refers to an online microblogging and social networking service which enables users and members to read and send text-based messages called tweets as long as these do not exceed the maximum 140 characters. The person behind the creation of Twitter is Jack Dorsey who established it on March 2006 and launched the social network on July of the same year. From the moment it was launched, it has received worldwide popularity. In fact, it has more than five hundred million active users at present while generating more than 340 million tweets every day. The site is also capable of handling more than 1.6 billion search inquiries daily. From the moment it was introduced to the public, Twitter has continuously become part of the top ten of the most visited sites online. Most users even refer to this as online SMS/SMS over the internet. For those users who are not yet officially registered in the site, they get the chance to access and read tweets from other Twitter users. Registered members can post tweets into the site, read SMS and access a wide range of useful applications for mobile devices. It should also be noted that while tweets are visible publicly by default, users are still given the choice to restrict the delivery of messages to their followers. Users can post and read tweets through the official Twitter site, short message service (SMS) which is now available on specific countries and any other compatible external apps including those that are designed for smart phones. If you want to learn Twitter and its many features and advantages, then be aware that Brainmeasures which is an extremely popular online certification and skill testing company is now offering a Twitter certification program designed to significantly improve your knowledge of Twitter. The Twitter course offered by Brainmeasures is a huge help when it comes to understanding all the features that you can use in this social networking site, the procedures that you need to follow when posting tweets and the basics of increasing the number of your followers. The kind of Twitter training which you can get from this certification course is also a huge help when it comes to honing your skills in customizing your Twitter account and using it for other profitable purposes such as marketing your products and services and boosting their exposure. 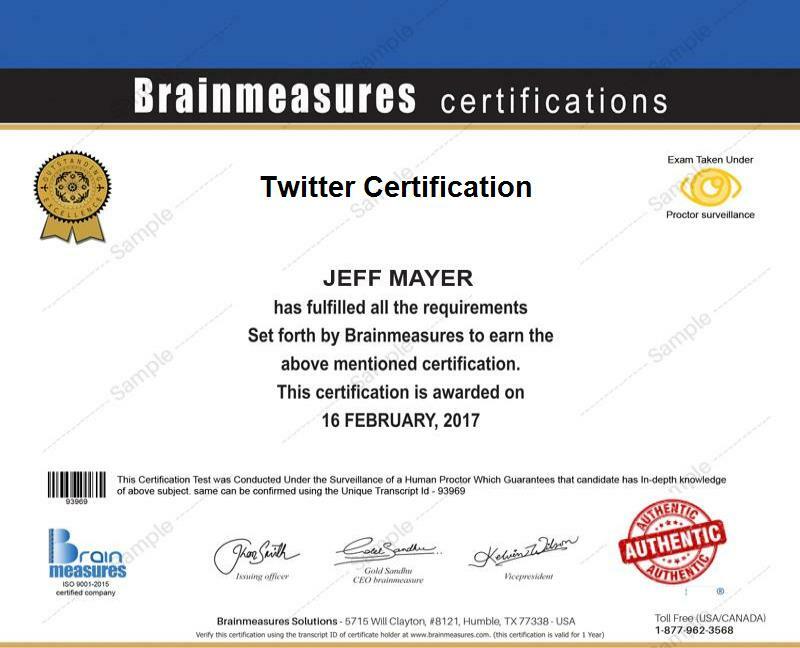 In order for you to finally grab a copy of your Twitter certificate, you need to successfully complete this Twitter certification program offered by Brainmeasures. How to reply to the direct messages you received in Twitter? How to use Twitter in Android G1? Enrolling in the Twitter certification program which is now part of the many offers of Brainmeasures is extremely beneficial to a wide array of professionals including those who are greatly interested in understanding social media and digital marketing. It appeals most to PR, marketing, sales and operations and communications professionals as well as sales managers and business managers who wish to improve the performance of their business by improving their knowledge about Twitter to maximize the results of their social networking and online marketing campaigns. Your Twitter certification will also allow you to enjoy a noticeable increase in the level of your salary. If you use the Twitter certification that you obtain in becoming a social coordinator, then you can expect this profession to let you earn around $46,000 per year. Being a social media manager is also rewarding because it to lets you receive an annual salary of $54,000 to $98,000. If you work as an online marketing manager, then expect to get around $61,000 to $143,000 annually.